Thought you might be interested in seeing what’s going on in the backyard. Every day I am amazed by something different and new. 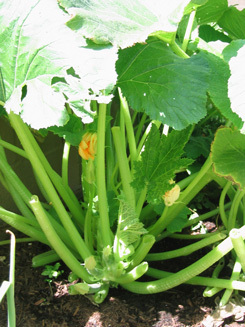 In particular, my mind is blown by how zucchini grows. The cultivar features a base of slender, tubular lime-green stalks that seem to wander as it matures. 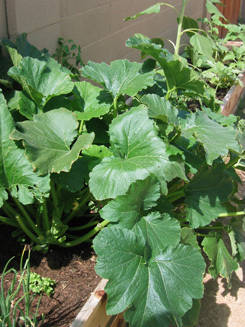 Two “black beauty” zucchini plants are the stars of the first three pics below. Under a massive canopy forest-green leaves, their fruits swell up seemingly by the minute. 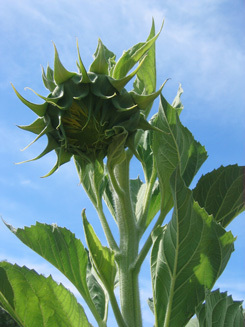 Also pictured: an 8-foot sunflower readying to blossom. While harvest time is nearing for my first crop of corn, I’m almost overwhelmed by my harvest of summer squash (early prolific straightnecks), cucumbers (burpless hybrids) and black beauties. 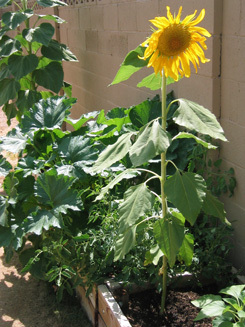 Also growing are tomatoes, watermelon, several kinds of peppers and sunflowers. A good friend of mine has suggested to me that I start writing about my passion for gardening, and how my experiences and hard work in gardening have influenced and informed my thinking about art. My friend’s idea reinforced a hunch I developed a couple of months back. Arguably, my new painting Open System, which will be showing in the 2009 Arizona Biennial, had at least something to do with the idea of growing things. 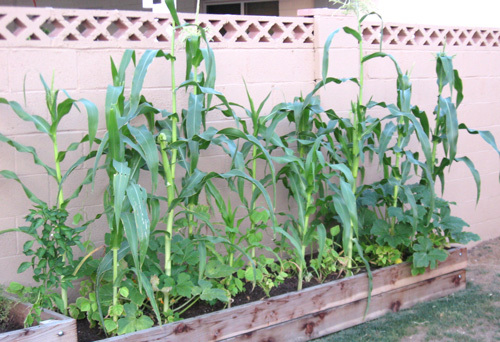 Having a garden is like having an open system. You have a limited plot of land, but you can grow a chaotic array of plants within in it. Gardening reminds you that things aren’t perfect. If you grow your own tomatoes, you know exactly how “imperfect” your tomatoes look compared with mainstream supermarkets’ tomatoes! They look like short, fat misshapen gourds, even! But your homegrowns will taste so much better than anything a big-box retailer will sell you. Each crop you grow will teach you something about what you’re growing, and it will also teach you something about yourself — how you “read” and tend to your crop is important. Gardening has transformed how I live. I consider it a lost art. When my octogenarian neighbors compliment me on what’s growing, I take that as a massive compliment. Back when they were kids, in the real Great Depression, everyone gardened. Related thought: Is a blog for every “side” of your life necessary? Her point is this: Most of her friends on Facebook are from a community of dancers who devote their entire lives to dance. If she were to have a blog, her dance friends wouldn’t be interested what she would be writing about, because she would be writing about things outside of dance. Therefore, my colleague concluded that she would need a series of blogs-10 of them, in fact-to address the many facets of her life adequately. I disagreed with her for two reasons: One, it’s very difficult to keep art and the rest of life compartmentalized. (I’ve tried. Forget it.) Two, if you were to try to keep more than one blog going, you’d be sure to take time away from each of the facets of your life that you love; in my colleague’s case, it’s dancing. Would you like to see more pics of the garden in these pages? What do you think?